TS Police Constables Results 2018, Final Answer Key download: Telangana Constable Hall tickets, TS Police Hall tickets: The link to download the Telangana Police Constable Hall Ticket / Admit Card was released on September 20, 2018, on the official website of Telangana State Level Police Recruitment Board (TSLPRB) - tslprb.in. TSLPRB TS Police Constable Results 2018: Telangana State Level Police Recruitment Board issued a Notification on 31-05-2018 for direct recruitment of 16,925 vacancies of SCT PCs Civil and / or equivalent Posts. 4,79,158 Candidates have registered for the said Recruitment and after de-duplication of Applications, total Candidates that were to take the Preliminary Written Test were 4,78,567. The Preliminary Written Test for the said Recruitment conducted on 30-09-2018, in 966 Examination Centres located in 40 Places (almost all the important Cities and Towns) throughout the State was attended by 4,49,650 Candidates. Preliminary Key for the above Test was made available on the official website: www.tslprb.in from 05-10-2018 afternoon onwards. Candidates were given an opportunity to submit Objections on the Preliminary Key before 5 pm on 08-10-2018. After resolving all such Objections and related issues, the Final Key has been arrived at, which is now made available on the Home Page of www.tslprb.in. The Schedule for filling-in the Part-II Online Application Form will be informed shortly. Candidates who are declared qualified in the Preliminary Written Test have to visit the website www.tslprb.in for uploading the Part-II Application along with scanned copies of the required Certificates / Documents as elaborated in Para 7. Instructions to Candidates for Filling the Part-II Online Application Form and Uploading in the Notification. Based on their respective Part-II Application Forms, Candidates will be informed the dates for downloading the Intimation Letter through the website (www.tslprb.in) for appearing in the Physical Measurement Test and Physical Efficiency Test with details of Venue, Date and Time. For all the relevant Candidates pertaining to the Notification Nos. 88, 89, 90 and 91 / Rect. / Admn-1 / 2018 dated 31-05-2018, the Physical Measurement Test and Physical Efficiency Test will be conducted only once, as mentioned in Para 4. Fee Structure (b) of the Notification, as per the procedure and rules described in Para 18. Selection Procedure / Scheme – B) Physical Measurements Test (PMT) and C) Physical Efficiency Test (PET) of the Notification. The candidates will be selected on the basis of Preliminary Written Test (PWT), Physical Measurement Test (PMT) and Physical Efficiency Test (PET). TS Police Constables Results 2018: Telangana State Level Police Recruitment Board, TSLPRB is has released the TS Police Constable 2018 Results on the official website. The official website, tslprb.in is not responding due to heavy traffic. Candidates who have appeared for the TS Police Constable Examination 2018 on September 30 are advised to check the official website after some time if they are not able to access their results. TS Police Constable Result 2018 Direct link and TS Police Constable Finel Key Direct link are provided below for reference. 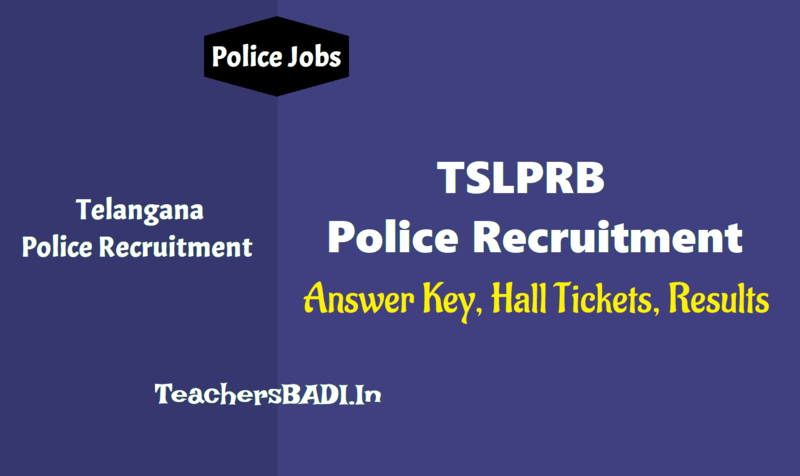 TS Police Constable Hall Tickets 2018: Telangana State Level Police Recruitment Board, TSLPRB would be conducting the recruitment examinations for TS Police Constable 2018 on September 30. As many as 4.5 lakh candidates have applied for the recruitment. The TS Police Constable Hall Tickets 2018 were released on September 20, 2018. Candidates are informed that the facility to download the TSLPRB Police Hall Tickets for the constable recruitment examination would end on September 28, 2018. Candidates are requested to download the hall tickets, if not already done, on tslprb.in. 1. Candidates are required to take the printout of the hall ticket on an A4 size sheet on both the sides. Remember, the TS Police Constable Hall Ticket should be on a single sheet of paper. 2. Hall ticket print out may or may not be a colour print out – though colour is preferred. 3. After printing the hall ticket, remember to affix a passport size photograph at the bottom left corner of the first page. Please remember that the photograph that was uploaded at the time of filling the online application form should only be pasted. In case a candidates has posted a different photograph, he/she is requested to download and print the admit card again. 4. Admission to the examination hall would be denied in case the hall tickets are not as per the instructions provided above. Candidates who do not have the hall tickets with the required pasted photographs would not be permitted to appear in the examination. The TS Police Constable Hall Ticket download link was made available from 8.00 AM on September 20, 2018 . The last date to download the TS Police Constable hall ticket is - September 28, 2018 (midnight). Candidates whose Hall Tickets could not be downloaded may send a request e-mail to support@tslprb.in or call 93937 11110 or 93910 05006. However, the official website is currently unresponsive due to too many users. The TS Police Constable Exam 2018 is expected to be conducted from 10 am to 1 pm on September 30, 2018, throughout the state. The candidates who have registered for the examination can visit the official website of the Telangana State Level Police Recruitment Board to download the hall tickets. This year, more than four lakh candidates have applied for the Telangana Police Constable Examination. After downloading the hall ticket/admit card, the candidates are advised to check all the details printed on it. In case, the details mentioned are not correct, immediately inform the concerned authorities.